Alpha's line-up of standard communication and control cables offers maximum choice and fewer tradeoffs. 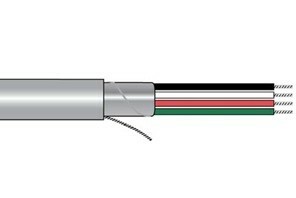 By offering a comprehensive collection of insulation/jacketing materials, shielding options, and conductor counts, the cable that meets even the most demanding needs can be easily selected. Alpha has cables that go beyond the ordinary to satisfy rigorous requirements of EMI performance, transmission distances, flexibility, and temperature extremes. Communication and control typical applications include audio systems: speakers, microphones, intercoms; broadcast and studio, data transmission: RS-232, 422, 485; CAD/CAM; computer peripherals; business machines; security systems: alarms, cameras, sensors; control systems; instrumentation systems; point-of-sale systems; and banking systems. Bare Copper Conductors. Plenum-Rated PVC Insulation and Jacket. Thank you folks for what you do.